Prison for Anti Gravity -  An epic journey of new discovery so fantastic that our natural instinct would be to block it out. Anti-gravity technology has been around for decades, and there is much proof of that. and difficulty while pursuing his developments. He was heavily criticized, ridiculed, and made a fool of by the press. If the release of this technology would completely wipe out the Oil Industry and collapse the monetary system, does that legitimize the suppressing of it? Is our collective consciousness ready for technologies that would change our entire society? it was quite clear that there was a huge attempt to shut Otis Carr down. These developments and curiosities were not for our world. ​He could not pay the fine and served part of a 14-year jail term. but they never flew again. ​Carr is reported to have suffered from ill-health, a broken man. He passed away apparently in Gardnerville, Nevada, in 198O. Take, for example, a recent investigation conducted by a Michigan State University professor and a former secretary from the Department of Housing and Development. Together, with a team of Ph.D students, they uncovered approximately $21 trillion that went missing and unaccounted for from the Department of Defense as well as the Department of Housing and Development. Why is this relevant? Because they discovered that the money was going to fund black budget, off the books programs that require no oversight from Congress. This black budget world has been in operation for many years. You can read more about it here and here in two articles I’ve previously written on the subject. he black budget world encompasses a separate civilization (Richard Dolan, “Breakaway Civilization”) that has used tremendous amounts of resources in all areas, from science to archaeology, to move itself far ahead of the mainstream world technologically. How many people does it employ? Who is operating it? Many of these questions remain unknown, but if you follow the money it will give you perhaps somewhat of an idea. 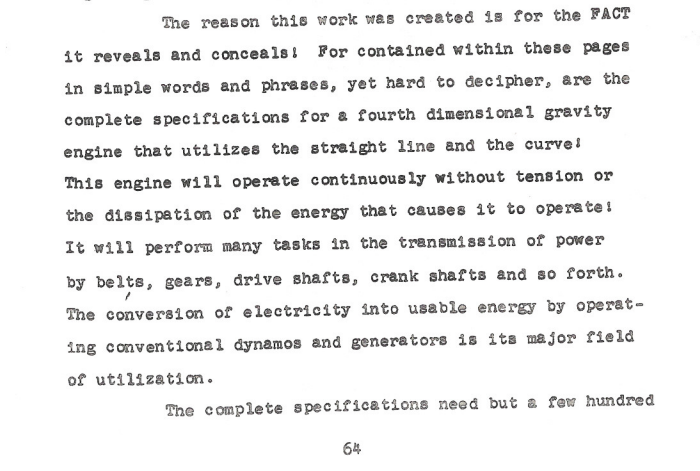 For example, the previous list regarding technology suppressed was obtained by researcher Michael Ravnitzky in 1971. Most of the technology listed seems to be related to various military applications. You can view that list here. In the late 1950s, OTC Enterprises, Inc. of Baltimore, Maryland put out a statement that was published in the April 3rd edition of the Baltimore Enterprise. 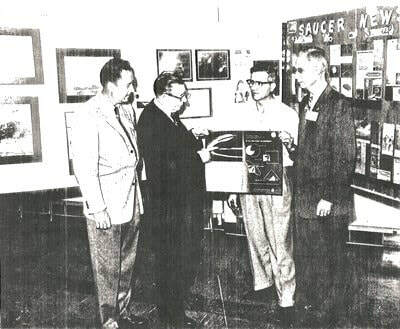 The statement came in the form of a claim that the company was ready to manufacture a flying saucer that was capable of travel outside of the Earth’s atmosphere. ​All that was needed was a massive amount of funding, approximately 20 million dollars. The equivalent to that today is probably several billion. ​Otis Carr with anti gravity vehicle model. Now keep in mind that this is the 1950s. There was a big wave of UFO sightings at this time, especially after the Atom bomb was dropped. The topic was getting a lot of mainstream media attention. Rumors of “crashed craft, and bodies recovered,” that Apollo 14 astronaut Edgar Mitchell claimed were real were running rampant at this time. “The “flying saucer” reached an altitude of 12,400 meters within 3 minutes and a speed of 2,200 kilometers per hour. 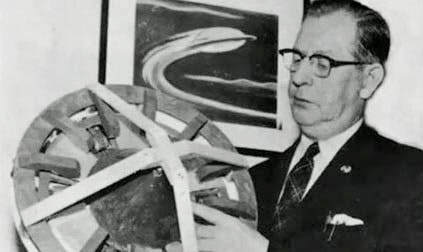 Klein emphasized that in accordance with German plans, the speed of these “saucers” would reach 4,000 kilometers per hour. One difficulty, according to Klein, was the problem of obtaining the materials to be used for the construction of the “saucers,” but even this had been solved by German engineers toward the end of 1945, and construction on the objects was scheduled to begin, Klein added. Think about it. We now know for a fact that global militaries have long had an interest in the UFO phenomenon. They’ve been asking who, what, where, when and how for a very long time, and of course it’s considered a national security matter. By then, his laboratory had been raided and destroyed, and the group of engineers had been ordered to disband and cease contact with one another. This is very fishy, and similar to the Stan Meyer water powered car story. Looking at it today, it was quite clear that this was a huge attempt to shut Carr down. These developments and curiosities were not for our world, but were reserved for the black budget world. He was denied an appeal on March 1st, 1961 for his ‘crime’. He could not pay the fine and served part of a 14-year jail term. After that little is known about what became either of Carr himself or the craft, but they never flew again. Carr is reported to have suffered from ill-health, a broken man. Take this quote from Hal Puthoff, for example. 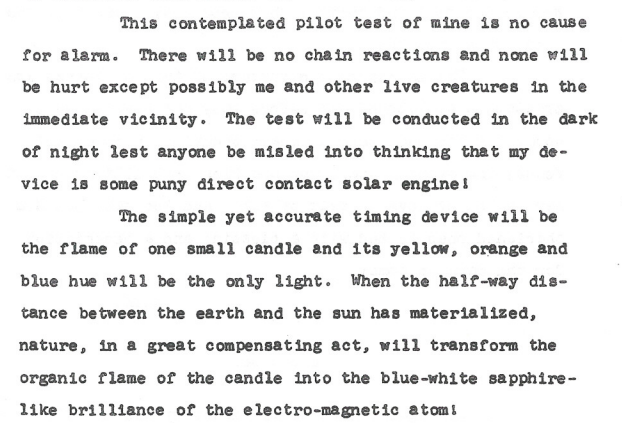 It’s not with regards to UFOs but more so “free-energy,” which actually go hand in hand and relate directly to each other. Puthoff has published numerous papers on electron-beam devices, lasers and space propulsion and has patents issued in the laser, communications, and energy fields. Let’s keep an open mind, and not to brush off revolutionizing technologies just because they break the laws of physics as we know them; after all, such laws are made to be broken. It’s similar to when Lord Einstein published his paper on special relativity that completely shattered what we thought we knew back then. Today, we are more aware of how the giant national security apparatus intervenes, and given all of the information that’s emerged regarding the subject of exotic technologies like anti-gravity crafts, it’s easier to see 70 years after the fact what really happened to Otis T. Carr.